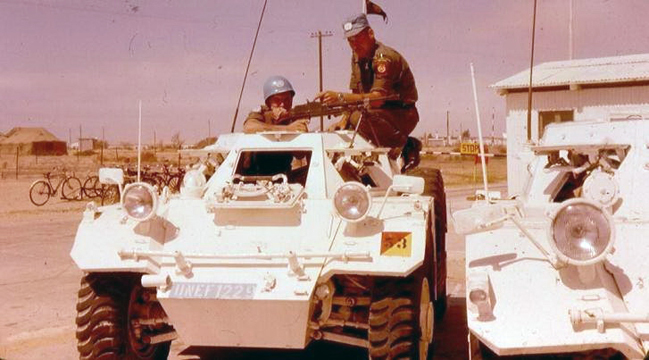 From 1957 to 1960 a Canadian squadron of Ferret scout cars served as part of the United Nations Emergency Force (UNEF) which separated the Israelis from the Egyptians in the Sinai and Gaza Strip after the 1956 Suez Crisis. UNEF was the brain-child of the Secretary of State for External Affairs, Lester B. Pearson, and was commanded by Canadian Major-General E.L.M. (“Tommy”) Burns. The Canadian contribution comprised a Royal Canadian Corps of Signals (RCCS) signals squadron, a Royal Canadian Electrical and Mechanical Engineers (RCEME) Workshop, two Royal Canadian Army Service Corps (RCASC) transport platoons, and 56 Canadian Reconnaissance Squadron, a composite unit drawn from the Royal Canadian Dragoons and Lord Strathcona’s Horse, which served with UNEF from March 1957 to January 1958. The Squadron had an establishment of 105 men and 29 Ferrets. Fort Garry Horse Ferret ca.1960. Note the AoS number ’53’. Subsequent rotations were drawn from 8 Canadian Hussars ((CH) January 1958 to January 1959); the Royal Canadian Dragoons ((RCD) from January 1959 January 1960); and the Fort Garry Horse ((FGH from January 1960 to January 1961). The Ferrets were withdrawn in August 1960 and replaced by jeeps. The Canadian contingent was withdrawn in 1966. An M1 helmet liner used by a Royal Canadian Dragoons corporal serving with UNEF’s Canadian Reconnaissance Squadron, that served in the Sinai and Gaza in 1959. Author’s collection. The Ferrets were painted white and bore, on their left front and right rear fenders, an Arm of Service (AoS) flash in the red and yellow colours of the Royal Canadian Armoured Corps (RCAC). Each rotation bore a different number superimposed on the flash: 56 for 56 Recce Squadron, 52 for the 8 CH squadron; 50 for the RCD Squadron and 53 for the FGH squadron. Approved UN headdress consisted of either blue berets, blue Canadian field caps or blue US M1 helmets. The helmets were obtained from a US depot in Livorno, Italy, and were issued to the Canadian contingent as they passed through Naples airport. The helmets were painted blue with a white decal bearing the UN’s emblem (a globe in a laurel wreath) in the front and the letters UN at the sides. However, some at of the Recce squadrons’ helmets owners also painted their units’ AoS flash on the left and their rank badge at the front. Illustrated here are two examples of M1 helmet liners worn by the RCD Squadron in 1959, one by a corporal, the other by a Captain. There is also an example in the Canadian War Museum, worn by a 1st Lieutenant complete with its steel outer body. Its AoS flash bears the number 51. Both of the RCD liners are of a pattern produced between 1950 and 1954, and may well be part of the batch issued in Naples, as this type of M1 was not procured by the Canadian Army. This liner was worn by an RCD Captain with the same contingent. Dean Owen collection.